Dr Lambert provides a rheumatology service which encompasses therapy for the entire spectrum of rheumatic disease. His particular clinical interests centre on the management of early inflammatory arthritis and the use of biologic therapies for resistant rheumatoid arthritis, psoriatic arthritis and ankylosing spondylitis. 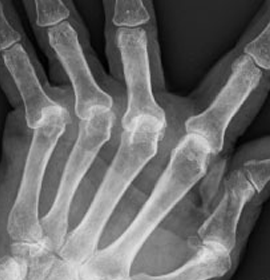 Xray showing erosion and deformity in Rheumatoid Arthritis.